"This was the first year. The cabinet ministers were new, they did not participate in the electoral campaign – they needed to become accustomed to working together, needed to feel how the cabinet works, how things function. A real tax and pension system reform will be performed next year," the chairman of the Budget and Finance Committee explained to those finding a serious tax reform lacking, LRT.lt writes. The Seimas passed next year's budget. It also accepted future tax changes which will be in place from January 1. The tax changes were discussed on the Dėmesio Centre talk show with Seimas Budget and Finance Committee chairman Stasys Jakeliūnas, conservative committee member Mykolas Majauskas and Lithuanian Free Market Institute president Žilvinas Šilėnas. S. Jakeliūnas observes that of the tax changes that were proposed so far, everything has been passed and the government's programme points are being implemented, even if not in full just yet. He points to business taxation, simplification of work based on business permits, citizen income tax depending on income, not on form of work as positive steps in the direction the cabinet is aiming for. While S. Jakeliūnas talks on a positive note about current achievements, M. Majauskas emphasises that in a number of spheres there is too little financing or too little work being done. "If Invest Lithuania brings 200 million euro in investment to Lithuania per year and creates around 4000 well paid jobs – let us grant them more financing, but we don't. Just look, tourist numbers are on the rise. This means that people are bringing their money to Lithuania – let us dedicate funding to state initiatives to bring even more of that money. We're not doing it. Let's see education statistics. Based on a series of education metrics we are behind, now is the time to invest into education, but we're not doing it. Look at health statistics: largest male mortality in the EU and the lowest lifespans, let's invest in psychological welfare. But we're also not doing it. So life is essentially continuing, governments change, professionals work, but life doesn't really change," the conservative stated, adding that there is a lack of political will in the current government to perform fundamental tax reform, instead presenting tax cuts for major farmers, which a number in the current Seimas directly benefit from. Ž. Šilėnas also observes some missing works. Primarily – a Sodra payment "ceiling". He observes that this has been long talked about and would create a more just tax system. Next he points to previous talks of reducing VAT, which also did not pan out. Instead, according to the head of the Lithuanian Free Market Institute, only tax increases can really be seen bar a raise in the untaxed income size and he observes that this is a trend that has been ongoing for a number of years now. Meanwhile budget revenue and overall funds are up – the time is ripe for tax reform. To criticism regarding the lack of implementation of a Sodra payment cap, S. Jakeliūnas responds that it is an element that is planned for, but first the whole Sodra system needs adjustments. The politician points to the government having resolved the issue of Sodra debt and assures that political will certainly exists for continued tax system changes. When queried why many of these changes were not done in the first year, the Budget and Finance Committee chairman responded that, "This was the first year. The cabinet ministers were new, they did not participate in the electoral campaign – they needed to become accustomed to working together, needed to feel how the cabinet works, how things function. This year was one of preparation and warming up. A real tax and pension system reform will be performed next year." For next year S. Jakeliūnas explained that it will be aimed to ensure that the cost of employment and the wage would be made equal, which should deincentivise off the books payments, following this there would apparently then be a basis for reworking the citizen income tax system, merging health insurance and citizen income tax, which could then open the way to returning to creating a Sodra payment cap. M. Majauskas notes that the conservative and farmer greens' electoral programmes have a similar stance on merging income tax and health insurance, however the current minister of finance does not support the move. The conservative laments that instead only cosmetic changes have been proposed while already a quarter of term has passed. Ž. Šilėnas adds to the politician's comment that he struggles to understand why a Sodra ceiling, which would have little fiscal impact on citizens was not established, but instead the Sodra floor was chosen, which will impact some 200 thousand people who earn the lowest incomes and will now also pay higher tax. Public discourse has also observed that cleaning companies, where many staff members only work part time, will be pushed toward off the books payments by such changes, or as Ž. Šilėnas adds – toward unemployment for the staff. "I do not understand why such a very socially sensitive and not fully thought through system was enacted, while a simpler one such as merging the Sodra payments or the same payment cap – was not," he states. To this S. Jakeliūnas responded that this was done in order to combat the black market economy where people are exploited, working for part time wages, but doing work full-time, while also not being insured and risking a reduced pension in the future. This claim does not convince either of the other two participants, who point out that it appears that the majority simply thinks that the 200 thousand individuals who will be impacted by the Sodra payment floor are all working off the books. M. Majauskas states that such an issue should be instead resolved by redoubling efforts to seek out employers who act exploitatively like this. Ž. Šilėnas agrees, noting that even in the public sector, many work part time and it would simply make no sense to describe them as working off the books. Furthermore, he adds he suspects that this measure was employed in order to cover for the planned "children's money" grant. The grant is to cost 190 million euro to the state, while this payment floor would contribute 75 million euro to the budget alongside 70 million received by removing the untaxed income size for parents. This would mean that the "children's money" grant would be covered at the expense of those working part time and by removing the previous tax exemption for having children. "Do not forget those who will use the main untaxed income size – this is a tax cut. Those who now work based on business permits pay 15%, however those who earn little will pay 5% income tax. 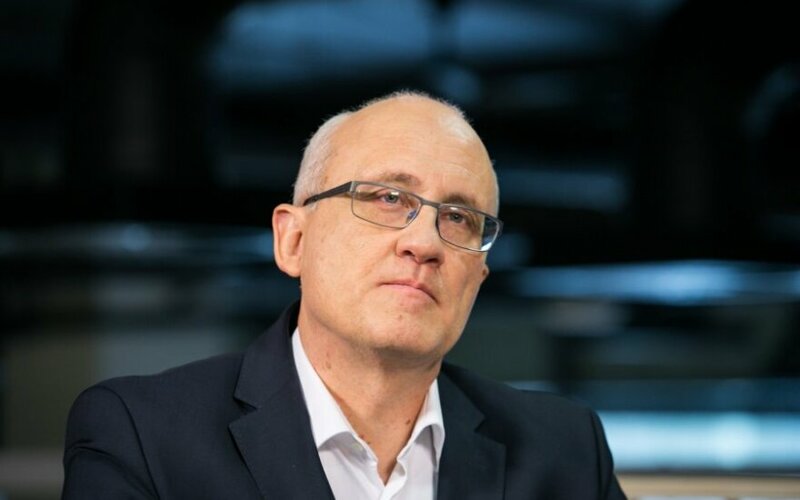 Taxes are decreasing for them as well," S."Jakeliūnas responded, explaining that the 5% income tax is aimed at supporting minor businesses and ensuring that they are not further burdened, while also having removed distinction by business activity and only focusing on annual income. M. Majauskas questions the limits set for the 5 and 15% income tax brackets, with the limit being 20 thousand euro. The politician notes that those earning 1500 or more would be paying 5% income tax, while doctors, teachers, civil servants and scientists would continue to pay 15%. S. Jakeliūnas responds to this that the 20 thousand euro limit was set in Seimas, not in the committee, which he chairs. The conservative politician also questions the application of the children's grant, pointing out that previously a similar grant would be automatically transferred to parents' accounts, without requiring further applications, while now they will have to visit the municipality or apply online to receive the grant, which will add an extra layer of bureaucracy. Furthermore he believes that while for many it may appear that they will receive extra money, in fact their taxes will rise and to receive this extra funding, they will have to fill out forms to make sure their lives are the same as before. S. Jakeliūnas downplays this, pointing out that, "You must fill out the form once and the money is transferred every month. The individual needs to state what account to transfer the funds to. These are just technical details." Ž. Šilėnas finds the situation suspicious and worries that such ideas of grants are in the vein of what he describes as the bad example of Poland, with intentions to shift people from "I work and earn" to "I was given." S. Jakeliūnas states that the previous system required extra earnings to receive the children's grant which disadvantaged the poor, while the new system is a universal decision. As for the future, he notes that the Polish example would not be emulated simply because of lacking financial capacities.